[XPBPINU] U-Boat Stocking Carts are designed to replinish finish products in high traffic areas. Utility carts are constructed in durable heavy duty steel designed to handle heavy loads. These heavy duty carts are 16" W x 60" L and turns on two fixed 8" center casters allowing it to rotate on its central axix. Four 4" swivel end casters help make turning easy. Each end features an engineered handle designed for easy handling with cross members that act as reinforcements and suppors for optional shelf. 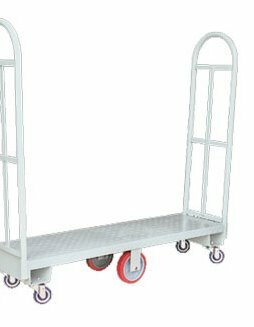 Wheel cart main deck plate features non-slip diamond perforated plate designed for keeping loads from shifting during use. Specification and detail information available upon request.